The latest UK chart results are in, and it's established titles that are mostly leading the way, with the most recent Switch hit showing that it has some potential longevity. Crash Bandicoot N. Sane Trilogy is still top of the charts for PS4, but in a repeat of last week Splatoon 2 is just behind in second place. That's very decent momentum for the shooter, and it held off a variety of price promotions that helped a number of multi-platform titles gain sales in the past week. Three other key Switch titles can be found in the all-format top 40; The Legend of Zelda: Breath of the Wild (predominantly sales of the Switch version) has fallen back to 16th place after a notable climb last week, while Mario Kart 8 Deluxe is just behind in 17th place. Despite the dip both titles are showing impressive longevity for Nintendo's system. After a revival last week (helped by hardware restocks) for 1-2-Switch, it's fallen back 15 places to end the most recent week in 39th spot. The 3DS had three major releases to accompany the launch of the New Nintendo 2DS XL, and the best-performing by a distance was Miitopia, which made its debut in 7th place. Hey! Pikmin struggled and only managed to secure 29th place, while Dr Kawashima's Devilish Brain Training: Can You Stay Focused? didn't make the all-format top 40 at all. An older title still holding its own, meanwhile, is Pokémon Sun in 36th place. A decent week for Nintendo UK, all told, even if only one of the games released alongside the New 2DS XL made a notable impact. Very poor debut placing for Hey! Pikmin. At least Splatoon 2 kept its chart place. There seems to be some UK stock of Switch this week, so hopefully software sales will follow suit. I got it 3 days ahead of release, and I've been enjoying my time with it. Let's the insanity of Miitopia begin ! Tomodachi Life stayed in the charts for ages. I hope Miitopia can do the same! Not surprised by Brain Training's performance, but I still got my copy, day one. It's great for making your mind more supple! Brain Training is years too late. How is 1-2 Switch still in the top 40ty but not ARMS? Now brain training is surely a franchise much more suited to smartphones! Well more people own a PS4 than Switch, so Crash Bandicoot beating Spaltoon 2 isn't surprising. Now give Crash Bandicoot a Switch / Xbox One release Activision! While Hey! Pikmin! is seen by a lot of people as a second rate outing for one of Nintendo's bigger IPs. People want the real deal I guess. As for Brain Training, I feel like that series hey day is long since gone. It was at it's best during the DS era. Crash is still number 1? Who said 3d platformers are dead. More 3d platformers please. Also, an Artoon/Arzest game not selling makes me happy. Doom getting love makes me so happy. It is seriously one of the best shooters this gen.
Also who is still buying GTA5? Not even a Mario game has ever even this evergreen. Good start for Miitopia. It was always the most appealing of those three games, even though it's kind of a niche game as it's a quirky humorous RPG. Now let's see how it does in the coming weeks. It's kind of sad everything I have read about Pikmin has been lukewarm or downright bad. Kind of upsets me that Nintendo was willing to bring out subpar games just to say that they used an IP. I heard they're expecting low sales for each and released them together to save distribution costs (source-friend who is a buyer at a UK retail chain). It is a proper 3d platformer. What do you even mean by it? Just because it isn't some open world Super Mario 64 type platformer doesn't mean it isn't proper. And yeah the first game is rough around the edge. The 2nd and 3rd ones are better games. @STAGGLY crash is kind of in-between 2D and 3D platformers in a sense. You can move in 3 dimensions, yah, but ultimately the level design is a lot closer to 2D platformers than to stuff like Mario 64, Banjo or Spyro. And not just because the level design isn't anywhere near as "wide" or I guess open as those. Anyway...give the other 2 a shot if you can. They're much better and if you at least liked what Crash 1 tried to do you're gonna enjoy those much more because they really build on that core while getting rid of or fixing the things Crash 1 got wrong. @Aaron09 1-2 Switch probably is suckering the same people in that lapped up Wii (fill in the blank title) back in the day. As for ARMS, the game just isn't very good. Coupled with limited appeal. Lose-lose combination. @gatorboi352 Arms is a good game. It is just that casuals are generally bad at fighters so will never buy them no matter what. It has shipped nearly 1.2 million already and will continue to increase from sales in the UK and around the world and will be an overall success. Agreed. Crash 3 especially is a superb platformer. Hey Pikmin and Brain Training bombed, especially the latter, which was the 12th best selling 3DS game of the week. Seems like the 4 year wait was worth it lol. Brain Training 1 on the DS sold 3.8+ million copies in the UK alone, making it the best selling DS game of all time in the region; the 3DS entry sold just a few hundred copies at launch. Splatoon 2 had a nice hold and has now surpassed 40,000 copies sold. Miitopia is doing quite well and seem to be benefitting from the success of Tomodachi Life. Hopefully this teaches Nintendo to drop Arzest as a developer - really given them lackluster games. Yep and don't forget the kart racer Which Activision did unfortunately. That is one of the big flaws in an otherwise great remastering. It feels somewhat incomplete without Crash Team Racing, which i actually think is a better game than Mario Kart 64 but then again i never really was fond of Mario Kart 64. @Tsurii Crash is a 3D platformer in the literal sense. It is a platformer in a 3D environment. Mario 64, Banjo, DK 64 and the works are 3D platformers in the marketing sense. They're 3D games with an emphasis on exploring and collecting things. I can count on one hand the number of levels that involve any kind of playforming whatsoever for any of these games. I had no idea there was a new Brain training game out there. Happy to see Crash in No.1. I'm more surprised about Miitopia's debut. Not bad, though I'm more interested in seeing how long it stays in the charts. 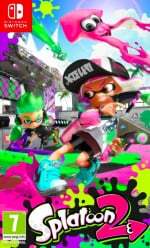 Nice to see Splatoon is still going strong, specially in a market that isn't very favourable for Nintendo.